Ribs. Ribs. Ribs ribs ribs ribs ribs. Ribs. Much for the carnivores in the array of burgers and ribs on the menu and the plethora of different scotches lends a uniqueness to what could have been an ordinary Young’s house. The vinyl album covers adorning parts of the walls aren’t a new idea, but the fact that they’re solely of Easy Listening artists is suitably naff but just about works, and there’s just about enough here to differentiate this pub from the glut of nearby establishments, even if the limited Young’s range may not be to everyone’s taste. Although I am loath to say anywhere is perfect, I am hard pushed to find fault with the newly refurbished Wargraves. I have used this traditional one room, corner boozer sporadically over the years but it always suffered from inconsistencies and failed to hit the mark as highlighted in previous reviews. 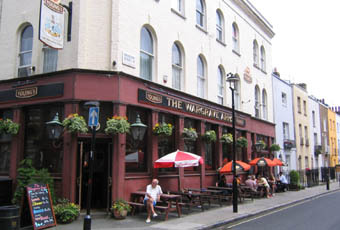 Most recently though on a trip to London I used the pub 4 times in a week and it hit the mark each time. Firstly they have four hand pumps on the go and all of the ales I tried (Young�s bitter, Young�s special, Otter Bitter and Tribute) were all very well kept and available at all times during my stay. Secondly the food has been ramped up considerably but thankfully not to that generic gastropub style with prices to boot. Instead they have a good selection of pub grub, fish & chips, bangers & mash, proper pies, bubble & squeak all freshly prepared in the open kitchen (with no microwave that I could see or hear) and most things under a tenner. Definitely one of the best pubs in the area and well worth a try. Really, really disappointing food. I guess I should've smelt a rat when I saw the chef had a McDonald's bag, but never mind. Service lady told us to sort ourselves out when she brought the plates over, because she didn't know who'd ordered what. My chips were possibly the greasiest chips I've ever had. Big let down. A Youngs house which is an oasis of relative calm away from the hustle and bustle of nearby Edgware Road. Sadly the tables and comfy chairs which used to be located under the windows near the bar were a casualty of the refurb to which the previous poster has referred. That said, the refurb has not, in general, impacted adversely on the pub�s atmosphere, and the bar service remains generally quick and friendly. Unlike most Central London pubs it tends not to get packed out early weekday evenings with office workers having a swift pint or 3 before heading back to the suburbs, something which I, for one, particularly appreciate.